The owner of The Daily Record’s former offices in downtown Baltimore wants $2.35 million to sell the building it converted into apartments. Developer 11 Saratoga LLC, after taking control of the building in the spring of 2016, transformed the property into 20 apartments. Broker SVN|RealSite recently listed the building, which maintains the newspaper’s exterior branding, for sale. 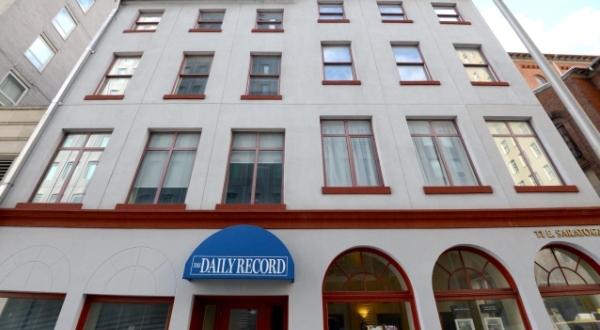 The Daily Record sold the property at 11 E. Saratoga St. for $550,000 to 11 Saratoga LLC in December of 2015. The newspaper moved its operations to a new home at 200 St. Paul Place in April 2016 after agreeing to a 10-year lease for 6,335 square feet of offices, maintaining its long tenure in downtown Baltimore. Rents in the converted apartment building at 11 E. Saratoga St. are 30 percent lower than what similar projects downtown charge, according to the broker. The multifamily asset features a mix of studio and apartments with one bedroom and one bathroom, and two bedrooms and one bathroom. Roughly 45 percent of the apartments are leased, and the property remains in the lease-up phase. Units in the building feature finishes including granite counters, stainless steel appliances, and PVC laminate flooring. The project is one of several office-to-apartment conversions in downtown in the last five years. A tax credit created by the city for developers who turn Class B office buildings downtown into apartments helped sparked a surge in redevelopments, such as the former Bank of America tower at 10 Light St. The Downtown Partnership of Baltimore, backed by the city, aims to transform what was once considered the central business district into live, work, and play community. A key part of those efforts involve reducing the inventory of unwanted office space while providing apartments to attract residents. The Daily Record’s history dates back to 1888, when it was founded by Edwin Warfield, who eventually was elected governor of Maryland. The paper originally was located at 124 E. Fayette St. until the building was destroyed in the Great Baltimore Fire of 1904. Following the fire, the paper set up shop 321 St. Paul St. before it sold the property to the city. In 1916, the paper, which moved to a four-story townhouse at 15 E. Saratoga St. Then, in 1927, the paper purchased the property next door at 11 E. Saratoga St., and built a three-story addition on the rear of those properties in 1935.